Home › INFORMATION › BPBO has Coffee that helps Birds! In December 2015 a group of BPBO members and friends traveled to Nicaragua. Great trip, but I’ll get right to the point about the importance of Nicaraguan coffee and the reasons for us in North America to purchase it. 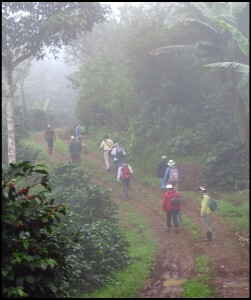 We traveled to the mountains of northern Nicaragua to El Jaguar; a family owned coffee plantation and nature reserve. We stayed right in the cloud forest; walked the tracks and sighted amazing birds, toured the shade coffee growing site and learned about the small scale production methods. We saw first hand the local workers starting the harvest, which runs from November to March. We also learned about its important role in supporting the livelihoods of rural families in Nicaragua. For the past 6 years the Bruce Peninsula Bird Observatory has purchased Nicaraguan shade-grown, organic and certified fair trade coffee from The Creemore Coffee Company in Grey County. Creemore C offee roasts the beans to bring out their rich smooth flavour and packages coffee and hot chocolate with the BPBO logo on the label. We raise funds by selling it ($15/bag)to supporters at BPBO events and through special outlets like the store at the Cabot Head Lighthouse, a popular spot for visitors on the Bruce Peninsula, spring to fall. Why do we sell Nicaraguan coffee? Bird friendly: As BPBO has been known to say, we here in Canada, share the birds in the migration corridor from North to Central and South America so lets support protection of the birds along the way. Shade plantations provide critical habitat for the birds in central America. Organization Friends in Nicaragua: BPBO has had partnership projects and communication with various Nicaraguan bird migration, protection and habitat preservation organizations and the staff and volunteers who work in these fields. Their resources are scare, but they are working hard in local areas to protect birds. Our proceeds from the coffee sales are designated to help our Nicaraguan partners. Coffee cooperatives in Nicaragua are Fair trade producers: We don’t know everything about this, but co-ops seem to be a good model for getting more money to local growers and workers. Following our trip, I asked Dave Nesbitt at Creemore Coffee about where his company gets the coffee beans so he sent me some great information. The coffee you purchase from BPBO/Creemore comes from the Nicaraguan Region of Madriz/ Nueva Segovia, a bit further north than we traveled in December. 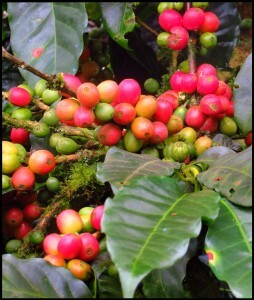 It is grown near the town of San Juan del Rio Coco, and comes from a smallholders cooperative specifically called the Cooperativas de Productores de San Juan del Rio Coco, Procafe FLO ID 2967. The beans are grown in shade plantations and the varieties are Boubon, Typica, Caturra and Catual harvested from November to March each year. Where can you get Nicaraguan coffee and Hot Chocolate? BPBO currently sells both from the Cabot Head Lighthouse gift shop and at our events, like the upcoming Annual General Meeting on April 23. Both sell for $15 a bag. The money raised goes directly to support bird migration and habitat research in Nicaragua.